If you said Mariachi bands or tequila, you're talking Jalisco. 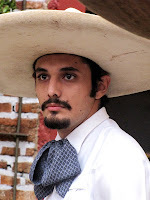 If you said charro, the Mexican cowboy, you're talking Jalisco, too, because all three originated here. So did the cry for independence from Spain and with the 200th anniversary of the Mexico republic coming in 2010, residents are particularly proud of their heritage and eager to share it with visitors. Very little is flat for long in Mexico, especially in the state of Jalisco, but that's no reason to stay away from this art-, history-, beauty- and hospitality-filled area. For the next few posts, I'll take you on a trip around the hills, cobblestones and sights the Levelers way. An easy place to start is Guadalajara, the capitol, which 3.5 people in its center and 5 million in its greater metro area call home. Warning: Guadalajara stays flatter longer than any other area in the state I encountered although you still have to be on your guard. As Ricardo, guide extraordinaire, warned of negotiating Mexican sidewalks, "In Mexico you can't walk and talk at the same time." Forget gawking on the move, too. It may be level but it's not flat and there are steps and stairs everywhere. It's a lively city with good restaurants, fascinating architecture and lots of traffic. Tip: Begin with a Tapitio tour in a double-decker bus to get the lay of the land and a feel for what you want to see. You'll want to explore the historic center - Centro Historico - with its cathedrals, squares and original government buildings. If you're into art, don't miss the powerful murals by Orozco, Martinez and other masters of this popular Mexican form of expression. 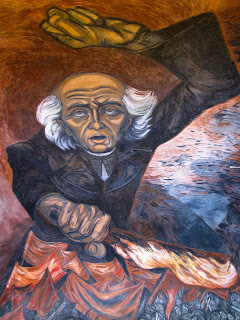 You'll have to negotiate a flight of stairs but the Orozco murals at the Palacio de Justicia - Palace of Justice - are worth it. Catercorner across the Plaza de la Liberacion, the Palacio de Gobierno has several large Orozco murals. Cross the Plaza de Armas and walk two blocks to the Biblioteca Iberoamericana to see murals by David Sequeiros and Amado de la Cueva. Tired or foot-sore? Pause at one of the cafes at the plaza's corners for a cold beer or soft drink. Tip: Take a cab - they're cheap, rarely more than 50 pesos (less than $4) to the Instituto Cultural Cabanas for more memorable Orozcos. If walking and taking stairs is too much, hire a cab to take you on a murals tour. Your hotel desk or doorman can set it up complete with cost in pesos or dollars. Love fashion? Don't miss the Takasami line by Maria Rosario Mendoza. 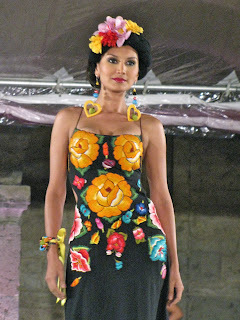 I saw a fashion show of her designs and was blown away by the incredible hand painting and embroidery. What a smashing souvenir of Mexico. 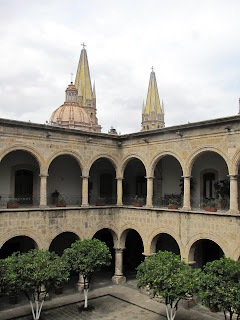 Guadalajara makes a good headquarters for side trips such as the day-long, famous Tequila Train or to the art villages, Tonala and Tlaquepaque, but more about those later. Travelers used to come to Florida for warmth, tropical scenery, oceans and beaches. Levelers will find all of that, plus flat surfaces and easy access in Flagler County. This little-visited area between historic St. Augustine and speedy Daytona Beach is a destination for anyone who wants to kick back and enjoy nature. Palm Coast, a retirement community that grew like kudzu to over 75,000, is the most populated area but Flagler Beach, with maybe 6,000 residents along A1A to the south, is its heart. There's only one high-rise condo (thanks to height restrictions hastily enacted by horrified residents it won't have company) and A1A flanks the ocean so nothing gets between joyriders and views of the ocean and red sand beaches. Much of what was built in the early 1900s is still around. Many private homes have become quaint shops, restaurants or inns (the first school house is now a tavern). The large and once glamorous Flagler Hotel is gone, replaced with a bustling Friday-Saturday farmer's market, a testament to the county's largely rural farmland west of I-95. Tip: The town is flat and compact - six or seven by three or four blocks centered on the 600-foot-long ocean pier where the fishing is good. Other than that, it's a nature lover's paradise. * Fish, bike, hike or just sit and enjoy the scenery and gardens at Washington Oaks Gardens State Park then go to its beachfront walkway at low tide to see the fascinating coquina formations. * Fish, paddle to or just tour Bulow Plantation Ruins Historic State Park. * Add to your count along the Great Florida Birding Trail, perhaps at Gamble Rogers Memorial State Recreation Area which stretches from the Intracoastal Waterway on the West to the Atlantic Ocean (via a convenient dune walkover) on the East. * Canoe, kayak or rent an electric boat to explore the myriad streams, tributaries and canals around the Intracoastal Waterway, including Bulow Creek, a designated state canoe trail. * See the first in-ground swimming pool built in Florida at Princess Place Preserve, a magical lodge once lived in by a rich divorcee and her Russian prince at the corner of the Matanzas River and Pelicer Creek. * Experience what it took to live off the land at the Florida Agricultural Museum with its Florida Cracker Cattle and Cracker Horses, descendants of those the Conquistadors brought to the New World. Tip: This facility is a lot more fun than its name implies and you can tour around its acreage on a wagon pulled by an old Allis Chalmers tractor that starred in the movie Cars! Accommodations? Take your choice. At one end, the luxe Hammock Beach Resort with its gourmet dining, lush ocean golf course, private beach, pool and lazy river complexes, spa, yacht basin and ocean-view condo units. Just off I-95, perhaps a mile from Flagler Beach, the very modern and comfortable Hampton Inn & Suites and Hilton Garden Inn. Several ocean/riverfront campgrounds offer spaces for RVs or primitive tenting. Then there are the anything but ordinary possibilities along A1A from the personality-filled Si Como No Inn and the collection- and possession-filled Topaz Hotel or its more traditional Motel to the much written-about White Orchid Inn & Spa. Tip: Before picking a beachfront spot for over-nighting, ask how many steps down to the beach. Erosion has eaten away many of the more gently sloped access points, leaving some very high and steep stairways. Dining? Same range. Blue Restaurant at The Topaz Hotel captures the gourmet crowd. A1A Burrito Works, a tiny hole in the wall with an outside picnic table dining room and to-die-for fish tacos, attracts the surfer set. Tip: Like books, don't judge beach-side restaurants by their covers. Un-chic shabby often disguises the best seafood joints. This is Florida before the glamor, glitz and theme parks. Leave your pretensions in the trunk for stops farther south. They're just kidding. More people are likely to visit Yellowstone in a day than will travel to Isle Royale in a year, yet this "little park that can" has the longest "stay rates" - 5.4 days - of any other national park and 25 percent repeat visitors. The expected uptick in visitors to national parks following Ken Burns' breath-taking PBS series probably won't change those percentages. Isle Royale, the largest of the 400-island archipelago at the upper end of Lake Superior, is about as isolated as you can get in the lower 48. - It's part of Michigan but closer to Minnesota and Canada than the Upper Peninsula. - The only way to reach it is by boat or sea plane. - And the only time you can do that is between mid April and the end of October. Transportation is very limited until mid-May through Labor Day; high season is July 15-August 15. There are other potential drawbacks. - No roads or cars: it's your feet or a boat. There are moose, wolves, fox, squirrels, loons, lots of birds, even more mosquitoes and 32 different kinds of orchids (most you'll need very sharp eyes to spot). So what do you do during the 16-17 hours of daylight? If you're reading this you probably won't want to spend all day hiking to a remote campsite as most visitors do, but there are kayaks, boat tours and excursions, ranger talks, fishing, shorter forays into the wilderness and kicking back to let the haunting sounds of the loons lull you to sleep as you listen for the real call of the wild, wolves. Tip: Elevation changes are relatively small but you don't find a lot of dirt underfoot; it's mostly rocks and roots. On your first foray onto a trail make finding a walking stick your immediate priority. Given upper Michigan's harsh winters, good, windfall candidates should be easy to find. I went over via the Isle Royale Line from Copper Harbor, a pleasant, three-hour trip. Boats also connect the park from Houghton, Michigan and Grand Portage, Minnesota. You can take the line over first thing in the morning and return that afternoon, but if you can, spend the night. There's a motel-like lodge at Rock Harbor, the larger of two visitor drop-off spots, that is comfortable. Tip: Rooms on the lower level have a continuous deck you can sit on and watch the sun set and, if you stay up late, the moon rise. If you like sipping an adult beverage while you do this, bring it with you. Beer and wine are available only by the glass in the dining room. There are some fun boat trips to surrounding areas. My favorite was to the old Edisen Fishery, up to the 1855 Rock Harbor Lighthouse - now an interesting and informal museum, then farther up to the moose boneyard outside the cabin of Rolf and Candy Peterson who have conducted the longest study of a predator, the wolf, and its prey, moose.You count dead moose by the bones found and they have an amazing collection. Tip: It isn't that steep but the paths are very rocky and rooty. You'll need a walking stick and sturdy shoes. Worth it though. Not worth it is the really steep climb from the water to the 1881 lighthouse on Passage Island. You might spot moose feeding in the spruce bog if you take a twilight excursion to Raspberry Island, but also take LOTS of bug spray; mosquitoes are fierce. As a travel on the leveler, this isn't the kind of park I was likely to seek out but when the opportunity arose I went and am glad I did. In writing this I feel again that wonderful sense of inner peace and relaxation wilderness engenders. And heaven knows, Isle Royale National Park is wilderness - 99 percent worth. While we're on Utah, let's not forget Capitol Reef National Park, north of Bryce on Scenic Highway 12. The visitor center is near where Mormons first settled, a pastoral spot on the Freemont River where they developed a 2,700-tree orchard of apples, peaches, osage orange, almond and walnut. They had a grape arbor and even produced wine which is why it was eventually named Fruita. You drive right to this flat area and can picnic under the Freemont cottonwood tree, the largest one you'll ever see. Catch a ranger talk to really make the area come to life. Tip: If driving a high-clearance vehicle you can drive to and through many of the scenic highlights. Check with a ranger first though, because weather conditions can change rapidly. Feel like walking a bit? Take in the first part of the Freemont River trail through the orchards, then hit the road to other trail heads. I went to the Oyler mine, one of many where uranium was mined in the early 1900s. Ranger Riley Mitchell also recommended Capitol Gorge and Grand Wash Trails for us Levelers. Tip: En route to Capitol Reef, Boulder Mesa Restaurant is a good place to eat. Beer drinkers should try a bottle of "Polygamy Porter." I got a kick just saying the name! Towns and gas stations are few and far between so keep that tank full. One town you might consider worth a pause is Bicknell, especially if you like to chalk up firsts/leasts/mosts/etc. It is the smallest town in the U.S. to have its own movie theater. Population is 325, the Wayne County Theater seats 306. Wayne County, by the way, has 2,500 square miles for its 2,500 residents. For more info, go to www.utahnationalparks.com and for a full feature on Utah, go to www.wellswords.com.